Home » Work » Ba-de-ya Ba-de-ya September! Ba-de-ya Ba-de-ya September! Ba-de-ya Ba-de-ya September! Ba-de-ya Ba-de-ya September! Pardon the lack of blog posts this week :-( I have been busy finishing the long overdue research that I have been complaining in my previous posts. I'd also like to apologize for all the rants and negativities I made. Anyhoo, thank you for bearing with me. I think a lot of people wished me well so in effect, I am now proud to say MISSION ACCOMPLISHED. I have submitted my paper at exactly 8:00 pm, still in time for the September 1, 2011 deadline. September 1 ends at 12:59 pm right? So even I submitted beyond office hours, I'm still in time. HOORAY! hahahaha I'm marking this date: September 1, 2011 for an important achievement. 1. SeptemBER starts the BER months. The Filipino Catholics always look forward for the month of December obviously because of the Christmas season. For us Filipinos, Christmas entails a lot of preparations from the company parties, reunions and celebrations at home. Though I try to celebrate the season in a more relaxed mode, the happiness of Christmas never fails to overwhelm me. I will not deny the fact that I can't wait for December too. My only prayer is that everything else will turn out fine over the next months. 2. September 1, 2011 marks my seventh year in working. I have been working for 7 straight years, I can't believe that it's been years. This made me reminisce my college days. It feels like I had just graduated from college yesterday. 3. September 1, 2011 is my first year in my new department with a new boss. :-) Who doesn't want to have a generous and supportive superior? I will forever be thankful to my boss because of the trust and opportunity he gave me. Thank you Sir! I'm looking forward in learning and working with you for more years. 4. FINALLY THE RESEARCH PAPER IS DONE ! - Sorry for being redundant ;-) After weeks of being lazy and days of cramming, I have finally submitted my research paper. The submission of my paper is just the first step in fulfilling my dream as a writer and researcher. If positive things happen to my paper, you (my dear followers) will be one of the first to know. For now, please continuously pray for me. 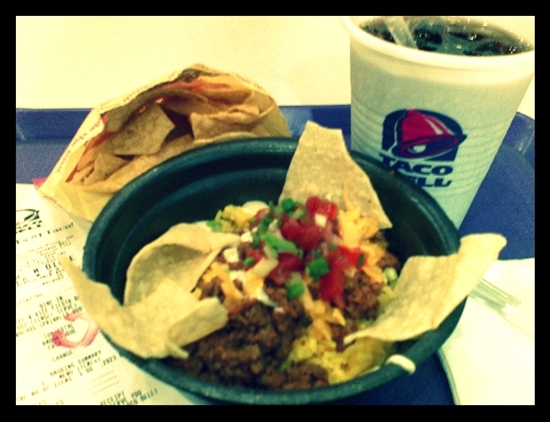 Taco Bell Rice Bowl Meal! Weight gain! But a happy day deserves to be a cheat day, agree or agree? I'm Christian, but September marks the start of the Christmas season for me too! And I start Christmas shopping for the pamangkins and inaanaks tomorrow. Hello Greenhills! You deserve a "treat" for sure!! Whats life without a cheat day!! Congratulations on finishing your research paper! You are now free to move on to many other exciting things. 7 years at a job is wonderful. Sounds like you have a lot going for yourself these days, good boss, and the ber months ahead..for me, I like the mer months better..like in summmmmmmeeeeeerrr..oh well, each season has it's own special flavor. Congrats on completing your project! Way to go!!!! Yay, Diane!!!! I hope the BER months are fantastic for you. I love posts like this because it really helps me get to know the blogger better. So who's the lucky girl?